Baby puree recipe with pear, berry and almond meal. It’s a healthy snack for babies 6-12 months who are making the transition to eating solid foods. Peel the pears, remove the cores and cut into small chunks- you can cook large chunks but you will need to cook them for longer. Put the pear chunks and water in a saucepan and boil over a medium heat for about 20 minutes, until they soften. The cooking time will vary depending on the size of the pear chunks. Add the raspberries and cook for 5 minutes until they become gooey. Add almond meal and cook for a couple of minutes. Puree using a hand wand (or mix in a food processor) until the mixture is smooth (or, for babies eight months and older, leave a few lumps). Before giving your baby this puree, introduce them to the taste of pears and berries individually- you may need to feed them each single-fruit purees 8-10 times until they get used to the taste, before introducing this two-fruit puree. Give your baby small amounts of puree to dip rusks into. They enjoy the taste (and probably the mess they make) and will also be practising feeding themselves. From about eight months of age babies should begin eating lumpy purees to develop the chewing muscles in their mouths. 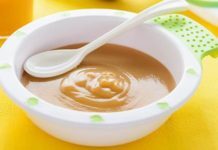 Leave some small lumps when processing this puree for older babies. Use frozen berries if fresh berries are not in season. This puree freezes well- put in the freezer in baby-size portions (e.g. freeze it in an ice cube tray). It can be stored for several months and thawed when you need a quick and easy baby meal. This puree also makes a great breakfast or dessert for the whole family. Just add a dollop of Greek yoghurt and some oats (or make the oats into porridge if you prefer your oats soft). You can use the pear and berries puree as the base for a pear crumble for dessert. Mix 70g of butter with 1 1/3 cups of oats, ¾ cup of plain flour and 2/3 cup of raw sugar. Mix the ingredients together then sprinkle over the top of the puree in a baking dish. Bake for 25 minutes.